New research explores the deep bonds that can develop between soldiers and the machines that help keep them alive. When Boomer was lost on the battlefield in Taji, Iraq, his brothers in arms gave him a funeral. The tribute involved a 21-gun salute, and the awarding of both a Purple Heart and a Bronze Star Medal. All in recognition, according to a soldier who has worked with Boomer's comrades, of Boomer's heroism and of the many lives he had saved on the battlefield. It was a funeral that was typical in every way but one: Boomer was a machine. He was a MARCbot, an inexpensive robot designed to seek out and disarm explosives. He -- Boomer was, apparently, a he -- saved soldiers' lives as he tooled his way into dangerous zones, taking one for the team in the most selfless way possible. The tributes in Taji, be they figurative (the Bronze Star) or more literal (the firearmed salute), recognized all this. "Some people got upset about it," the soldier recalls of Boomer's improvised funeral, "but those little bastards can develop a personality, and they save so many lives." The little bastards do save lives. Their personalities, however, aren't so much developed as they're imposed by their human minders. In the heat of battle, and in the chaos of war zones, soldiers, it seems, tend to humanize their robotic aides. They develop emotional attachments to the machines that put themselves in harm's way so the humans don't have to. That's according to research conducted by Julie Carpenter, a researcher at the University of Washington who studies the emotional relationships that humans can develop with machines. 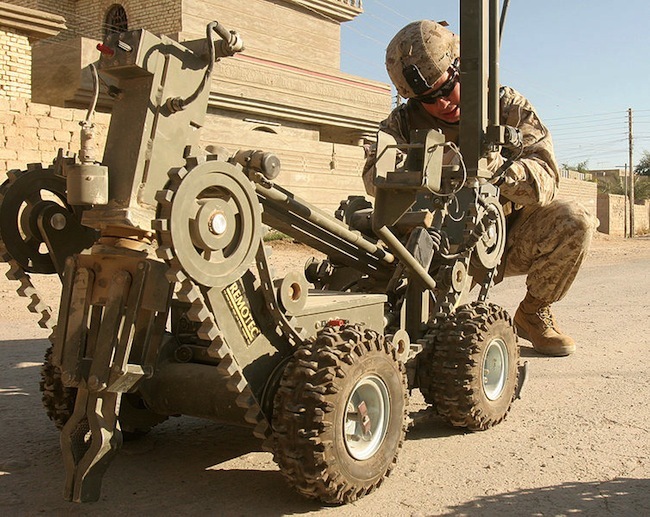 For her doctoral dissertation, Carpenter interviewed military personnel who specialize in Explosive Ordnance Disposal – who are expert in using robots, essentially, to disarm explosives. Her interviewees included 22 men and one woman from every branch of the military. Carpenter's work follows in a long tradition of academic research that has sought to understand whether -- and, more accurately, how -- human empathy extends to inanimate objects. Scientists have long been fascinated by the emotional attachments we form with our devices, be they smartphones or stuffed animals. And that's in large part because we humans, it turns out, have an amazing capacity to anthropomorphize the tools that help us navigate through the world. From that perspective, it makes sense that the tools that do so much work in the high-stakes environment of the battlefield would engender devotion from the people they benefit. According to Carpenter's research, the soldiers assigned their robotic companions "human or animal-like attributes, including gender." Furthermore, they "displayed a kind of empathy toward the machines." And "they felt a range of emotions such as frustration, anger, and even sadness when their field robot was destroyed." Some soldiers, Gizmodo has reported, "have even taken their robots fishing with them and let them hold the pole." Indeed. While the soldiers "were very clear" about robots being tools, Carpenter explains, she also detected patterns in their descriptions suggesting that "they sometimes interacted with the robots in ways similar to a human or pet." Which, again, makes sense. "These robots are critical tools they maintain, rely on, and use daily," Carpenter puts it. "They are also tools that happen to move around and act as a stand-in for a team member, keeping Explosive Ordnance Disposal personnel at a safer distance from harm." In that context, a beloved PackBot named Scooby Doo is perfectly logical. While clearing an IED on a bridge, my Talon decided to make left face and head directly for the only gap in the guard rail on the entire bridge. My team member started screaming that he had lost comms with the bot and was frantically powering down the system in an attempt to stop the bot from plunging in to the Tigris. The bot stopped with about 25-35% of its length hanging over the river, and the only thing keeping it from going over was the weight of the water bottle charge it was holding in its gripper. The team, redditor mastersterling continues, brought in another robot, a PackBot, to "drag the Talon back to safety." That didn't work, though: Talons are big and bulky, and PackBots tend to be 60-pound affairs. "So we had the Pacbot [sic] hook a rope to the handle and pulled it back to the middle of the road manually." Everyone survived. And I do mean everyone. The soldiers had given their cheeky little PackBot a cheeky little name: Danny DeVito. And from that day on, the Talon robot that had been rescued from the brink was given a name that commemorated his brush with suicide. The robot was henceforth known as Owen Wilson.